Since their market launch, the Klingspor SMT abrasive mop disc range has successfully taken the place of the grinding disc in many areas of surface finishing. The performance of the abrasive mop disc, with its fan-shaped radial arrangement of cloth grinding flaps, far exceeds that of other abrasive products. Klingspor abrasive mop discs are made of zirconia alumina, ceramic, or aluminium oxide coated flaps fastened to glass fibre-reinforced or plastic backing plates. The even arrangement of the flaps guarantees high flexibility, constant high grinding performance and low vibrations. 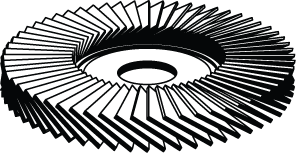 SMT is the abbreviated form of the German word for abrasive mop discs – Schleiffmopteller. Ideal price-performance ratio for universal implementation. Excellent grinding results on different steel materials. 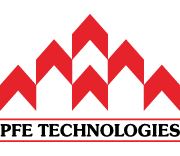 Professional products with excellent service life and high stock removal rate. Aggressive grinding and long service life. The three abrasive mop disc components are perfectly integrated to achieve maximum performance. Klingspor has developed special coated abrasives for its abrasive mop discs. The grinding tool is perfect for use with high speed angle grinders (80 m/s) and corresponding applications. This ensures top grinding performance and long service life. Klingspor uses two different backing plate types to produce abrasive mop discs. The first one is the most popular on the market made of glass fibre; the second one is made of plastic. The glue (adhesive) is the joint between the backing plate and the grinding flaps. It ensures that the grinding flaps cannot come off the backing plate if used properly. It also ensures safety far above the guidelines of the oSa directives and the EN 13743 safety standard. The convex abrasive mop disc grinds a narrower surface than the flat abrasive mop disc. The more selective use of the convex disc achieves a greater stock removal rate per time unit as compared to the flat mop disc. The convex abrasive mop disc is particularly suited to working on edges and welded seams. 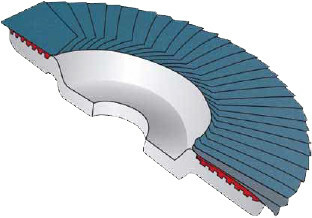 The flat disc is primarily used for flat and surface grinding. The abrasives used have also been engineered to work with high-speed angle grinders (80 m/s) and are designed to offer a wide range of possible applications. The optimised arrangement of the grinding flaps ensures first-rate grinding performance, long service lives and optimised utilisation to the end. The cloth flaps are coated with zirconia alumina, ceramic or aluminium oxide and spaced equally on the backing plate. The optimised cloth-reinforced backing guarantees the operator a fresh grit and, thus, consistent removal throughout the entire work process. A special manufacturing process ensures an exceptionally strong bond between baking plate and grinding flaps and produces a level of break resistance that easily exceeds the provisions of the oSa and EN 13743 standards. The backing plates included in our SMT range are made of glass fibre or glass-fibre reinforced plastic. They are extremely hard-wearing and deliver optimal power transmission to the work piece. The information and pictures in this page is extracted from the Klingspor Catalogue, provided by Klingspor AG. A copy of this catalogue may be found here. The information is on page 187 – 189. Text and images copyright Klingspor AG, 2015.